January | 2015 | KMG Consultants Inc.
It’s often said that discipline and self-control are natural behaviors that some have and some don’t. This is simply not true. While we all have tendencies that differ among us, self-discipline is a learned behavior that we can all obtain with just a little effort on our part. 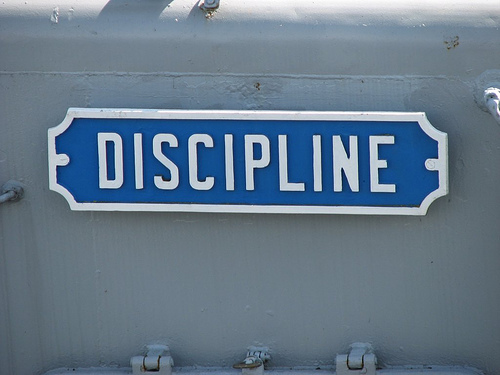 What is self-discipline and how do we benefit from it? Disciplining ourselves means controlling our impulses enough to ensure more long-term satisfaction, happiness, and success in life. In other words, we know what we want, but we get in the way of having it by choosing immediate pleasures over more beneficial long-term decisions. For example, no matter how much we want to lose weight, it’s sometimes difficult to resist a cookie that’s right in front of us. We know we shouldn’t eat it, but it’s so difficult to resist! One cookie won’t be a deal breaker, but if we eat a cookie every time we crave one, it can add up fast. This is where discipline comes in. It’s about overcoming that temptation to do what we know is right for ourselves. Giving in to every impulse will never satisfy us completely, and only leave us wanting more, never fulfilled. Instead, the things we truly desire often require discipline. Looking our best, having money, and living a long, healthy life are typical desires that can be achieved with discipline. Begin small, trying to make some new good decisions each day. If you get an urge to do something you know you shouldn’t, tell yourself two things: Number one, it’s just an urge, and nothing else. And two, it will pass. It’s very important to first realize that these impulses are purely in our mind. Our previous behavior is directing our choices, and our minds convince us that changing the behavior is too difficult. But it’s not. Ask an ex-smoker how they quit and you’ll get a variety of responses. Some were able to quit cold turkey, and some used nicotine patches or gum. Either way, they simply convinced their brains that smoking is part of the past, and that new thoughts will be replacing those old thoughts, and new desires will replace the old urges to smoke. This is how discipline works, and anyone can do it. Start ignoring the thoughts that lead to giving in. Remember your desired outcome, and think of each temptation as an opportunity to ignore it, and get closer to that outcome. Many, many people have overcome great challenges to become very successful. But they had to start small. And remember, if you slip up once or twice, it’s not the end of the world. Sometimes you really do need that cookie—just monitor yourself to make sure that you don’t make a habit of it. So take that first step. Remember your ultimate goal, and overpower your impulses with thoughts of control. With this discipline, there’s no stopping what you can achieve. For more information about KMG Consultants, head over to our website at http://www.kmgconsultantsinc.com.